With renegade Apaches and deadly gangs of outlaws running rampant in the Texas badlands, Texas Ranger Captain Quincy has no choice but to divide his band of Rangers and take on some new recruits. 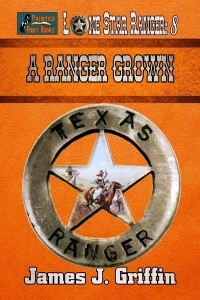 This mission is the most dangerous yet for Nate Stewart, who, at fifteen, is the youngest Ranger in the company. Now serving under Lieutenant Jeb Rollins, Nate and his best friend, Hoot Harrison, must face the fact that this may very well be their last mission—ever. The odds are stacked against them from the outset, with prairie fires, roaming bands of dangerous desperadoes, and the harsh conditions of the land they’re traveling. Pinned down by a party of Mescalero Apaches, it falls to Nate to lead—will he be up to the task? Getting himself and his fellow Rangers out alive is a job for A RANGER GROWN.